From the famed publisher and poet, author of the million-copy-selling collection A Coney Island of the Mind, his literary last will and testament -- part autobiography, part summing up, part Beat-inflected torrent of language and feeling, and all magical. LAWRENCE FERLINGHETTI was born in Yonkers, New York in 1919. Founder of the famed City Lights Booksellers and Publishers, he is an activist, painter, and author of numerous works of poetry, prose, and drama. His A Coney Island of the Mind is one of the bestselling poetry books of all time. Among his many honors are the Los Angeles Times' Robert Kirsch Award, the NBCC's Ivan Sandrof Award, and the ACLU's Earl Warren Civil Liberties Award. He is also a Commander of the French Order of Arts and Letters. He lives in San Francisco, close by to the bookstore he founded. "A volcanic explosion of personal memories, political rants, social commentary, environmental jeremiads and cultural analysis all tangled together in one breathless sentence that would make James Joyce proud. . .[Ferlinghetti is] the silliest, angriest, kindest, smartest man you’ve ever heard — a whirling dervish of scholarly asides, literary allusions, corny puns and twisted aphorisms. . .No one alive carries the history, the writers, the personal experience of 20th-century literature in his mind as Ferlinghetti does. . .There’s something hypnotic about Ferlinghetti’s relentless commentary, a style that amuses him, too. . .If you're willing to let go, he'll win you over." "Ferlinghetti maintains [an] unrelenting mental deluge, scraping the furthest edges of his memory and imagination, like a socially conscious John Ashbery on Benzedrine. . .Ferlinghetti's wits are afire, his wisdom is wide and deep, and this little book is packed with incredible sentences. . .He's still got it." "Ferlinghetti has not just survived for a century: He epitomizes the American culture of that century. Specifically, he has been a unique protagonist in a national drama: the American struggle to imagine a democratic culture. . .Is Ferlinghetti’s career as an influential, best-selling poet a story of high culture or of popular culture? Is his City Lights, as bookstore and publisher, a San Francisco tourist trap? Or is City Lights a literary, moral and legal shrine that not only published Frank O’Hara’s “Lunch Poems” and Allen Ginsberg’s “Howl and Other Poems” but in a 1957 court case established First Amendment principles that transformed American life? The store’s North Beach location has been designated an “official” San Francisco landmark. Is that a funny contradiction in terms? Or a triumph? The answer to all these questions is, emphatically, yes — all of the above. . .The story of Little Boy echo[es] a great national question. . .Who, little boys and girls, juvenile yet old, do we think we are?" "Lawrence Ferlinghetti has given us a slice of his cake in the form of a dense, daffy, and often delightful prose-poem. It’s a surging century’s worth of language that combines elements of memoir, journaling and comic wordplay, with hints of an alternative State of the Union address. . . A headlong rush of thoughts, memories and shameless whimsies. . . Happy birthday, Ferlinghetti. It’s a lot of candles. Strike another match across the night sky." "A torrent of textual splendor. . . Everything Ferlinghetti has read, written, lived, experienced, thought and understood in his near-hundred-years on this planet has been tossed into the blender of his consciousness. Little Boy gives us the opportunity to watch as it all swirls in that blender, the blades slowly bringing all these disparate particles together into a more homogenous flow — everything connected, everything consequential, yet without direct plot or meaning (much like life itself). . .If Little Boy is just a dream, then it’s one you can easily get lost in. . .wandering one last time through the Coney Islands of an iconic poet’s mind." "As a poet, [Ferlinghetti] has rarely been a critical favorite. But his flexible and plain-spoken and often lusty work — he has published more than 50 volumes — has found a wide audience. . .[Little Boy] is a summing-up near the end of a big, wide, productive life." "[Ferlinghetti's] mind is still on fire." "Prolific. . .propulsive and exceedingly personal. . .A local philosopher-hero's origin story." "Ferlinghetti is central to America’s literary and cultural life. How do you even begin to describe his many decades of achievement? Ferlinghetti has done it himself. 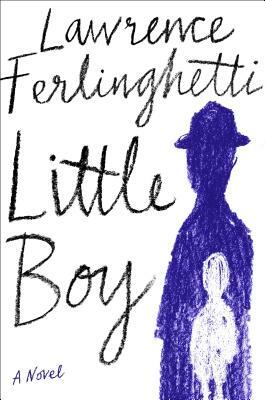 Little Boy is a hallucinogenic stream-of-consciousness, autobiographical prose-poem. . .It’s a book full of the artists, poems, travel, loneliness, and joy in Ferlinghetti’s long life—the whole arc of his human experience passes in a sustained collage of images. . .An indelible wonder." "A Goethean poly-directional consciousness on an exciting journey through time and space, Ferlinghetti’s unclassifiable act is delightful, tragic, magical. Here is seriousness at play with all the power of a spontaneous concert. Bravo Maestro Lawrence!" “Ferlinghetti has given us a uniquely revelatory book. At first his narrative was what I'd hoped it would be, and then his words turned, like lively flashing fish, into what he wanted it to be, so he could leisurely reel me in, ever so surely, to his sublime conclusion. Little Boy evoked my surprise and delight — thank you, Lawrence!